If you’ve never heard of the Starburst pokies game, chances are you’ve never played at an online casino before. Starburst is an online slot game from NetEnt, and is one of the hottest and most popular pokies of all time. Find out what makes this game so popular and discover where you can play Starburst for real money bets at the best online casinos. The key to Starburst’s popularity lies in its simplicity. It’s effective and engaging without trying too hard, while offering plenty of features to keep players entertained. As an instant-play game, it’s available to play directly over your Web browser with no downloads required, so all you need to do is tap or click any of the links above to give it a go at a trusted online casino. 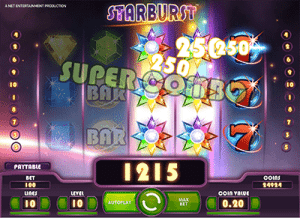 Starburst is a five-reel, three row video pokies game that uses an intergalactic theme filled with colourful space-age gems. To play for real money, just make an instant deposit using a trusted payment method like Visa, MasterCard, Skrill, Neteller, or Paysafecard. Once your account is funded, select the size of your bet using the buttons at the bottom of the reels. You can activate from one to 10 paylines at a bet level between one and 10, with a coin value of $0.01, $0.05, $0.10 or $0.20. The minimum bet in Starburst is a low $0.01, while the maximum bet is $20.00, with its affordability adding to its popularity. There’s also an auto-play feature, where you can have the computer play a predetermined number of spins on your behalf. Starburst offers a maximum jackpot of up to 50,000 coins and carries a theoretical RTP of 96.1%. Symbols in Starburst are on the simple side, yet like everything that NetEnt touches, they’re designed to be sharp and eye-catching. There’s colourful gems in purple, blue, orange, green and yellow, plus a lucky seven symbol and a gold bar classic slot symbol. All wins pay from left to right, with only the highest active bet line from both ways paid. Starburst Wilds – The only bonus feature in Starburst is the wild symbol and this is where your biggest winning potential lies. Starburst wilds an only appear on reels two, three and four, substituting all other symbols to form a winning combination. One or more wild symbol appearing on these reels activates the Starburst Wilds bonus feature, where wilds expand to cover the entire reel and are held in place for the duration of a free re-spin. If a new wild appears during the re-spin, it too will expand and hold in place together with any previously held reels for another re-spin. The maximum number of re-spins allowed is three in a row. Starburst is one of the most popular online casino games of all time, and as such you’ll find it available at a majority of all the leading NetEnt or multi-provider casinos on the Web. Starburst is so popular that many online vendors use free spins on this game to entice new players to sign up for an account with their casino. You’ll find Starburst available to play for free in practice mode or real money bets at all of the trusted casinos listed in the table above. Signing up using our links will gain you access to exclusive welcome packages that include matched deposit bonuses and free spins, many of which just may be on Starburst. 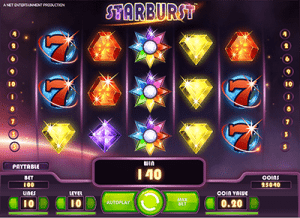 Starburst is the perfect example of what constitutes a solid online pokies game. It’s vibrant, its crisp and it translates perfectly onto all devices, making it equally suitable for desktop and mobile play. It manages to be visually striking and engaging without over-selling itself with confusing features, which is what makes it so suitable for newbies and why it’s so often offered as part of free spins packages. Of course, if you prefer your games studded with animation or unique bonus games, Starburst will leave you hanging, but if what you’re looking for is a reliable slot game that looks great and has the potential for some decent wins, Starburst ticks all the right boxes.